Dublin is a very manageable city to navigate. It is a good base in that you can mix city days and country days. You can maintain the city life for a wide selection of restaurants, music and night life and still see the rest of Ireland by day tours out. There are a good number of interesting tours to get an overview of the highlights an sights of Dublin. Check out some of the best Dublin sightseeing tours and start your planning early. Another good buy if you are staying in Dublin and plan to see a number of sights is the Dublin Pass. It is available for 2, 3 or 6 days and includes over 30 attractions including transportation from the airport by Alcoach and special discounts at several shops, restaurants and service providers. Best of all the Dublin Pass lets you skip the queue at the attractions and walk on in Sights include those in Dublin proper and the surrounding area, among the most popular are Dublin Castle, The Dublin Writers Museum, the National Gallery, National Museum, Natural History Museum, the Guinness Storehouse, the James Joyce Museum, St. Patrick’s Cathedral and more. There are three major areas in central Dublin: that part north of the river Liffey, Southwest Dublin and Southeast Dublin. There are many things to see concentrated in these areas and in the circle as you move out of Dublin proper The electric rail service called Dart connects the suburban areas of Dublin to the center and makes several stops in the center It is an efficient way to get around. Starting in the Southeast you have the famous Trinity College founded in 1592. It is an oasis from the buzz of Dublin and a spot rich in history. Don’t miss the Old Library, and the Treasury housing the celebrated Book of Kells , one of Ireland’s most richly decorated medieval illuminated manuscripts estimated to have been written in AD 806 by the monks of Iona. The National Museum and Library are also found in the southeast as well as one of Dublin’s most popular pedestrian streets, Grafton Street. It’s a great shopping street and most alive with talented buskers and pavement artists. As you walk along be sure to stop at Bewley’s Oriental Café for a cup of tea or coffee and enjoyment of the Victorian ambience. And after that cup head to St. Stephen’s Green for a picnic lunch or a walk in the park where you will hear lunch time concerts in the summer time. Before you leave the southeast walk by Merrion Square and bask in one of Dublin’s oldest and grandest Georgian Squares. Take some time to walk around and review the plaques on the buildings to get a sense of the many people of history who have lived and worked in this square. As you get more acquainted with Dublin you will be amazed at the number of great literary figures produced there. To get a good glimpse of life in 1800s Dublin stop by Fitzwilliam Square and visit number 29—a Georgian showpiece home. Southwest Dublin is home to its two greatest cathedrals, St. Patrick’s and Christ Church. Behind Christ Church visit the interactive museum of Dublinia where medieval Dublin will come alive. A short distance from Dublinia stands Dublin Castle, whose luxury state apartments and St. Patrick’s Hall are well appointed and reflect the local products such as Waterford crystal chandeliers. A stop at the Dublin Civic Museum will acquaint you with the history of the city from Viking times to the present. For a great shopping experience take in the covered market and Powerscourt Townhouse here you will find a range of things from antiques to fashion accessories and arts and crafts. 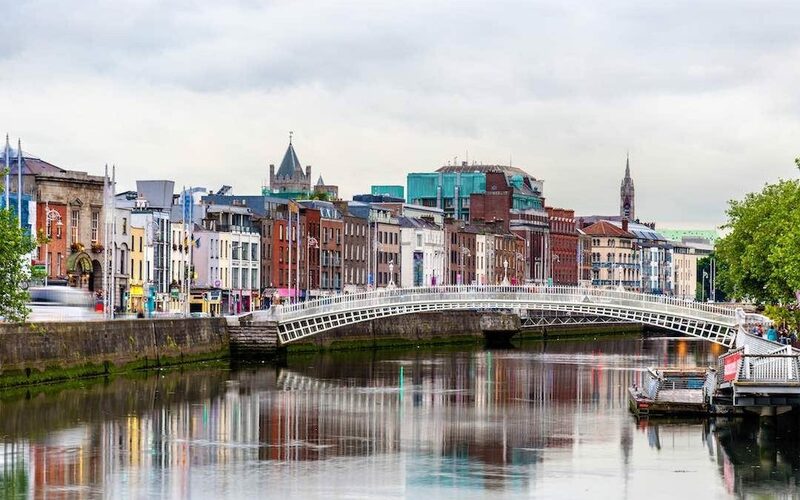 Now before you leave southwest Dublin, you must journey to Temple Bar, its cobbled stoned streets are home to some of the best entertainment, restaurants and shops in Dublin. Some call it the ‘arts zone’. To get a real feel for the Irish pub, the social focus out of which Irish culture was born, take the Pub Crawl Tour. The two and a half hour tour is led by 2 musicians who take you to 6 of the best pubs while telling you the history of Irish music through song. A better time cannot be had. Moving to the area North of the Liffey, you will journey across the Ha’penny Bridge, nicknamed as such due to the half penny toll issued in 1816. The bridge is now known as the Liffey Bridge and is a much photographed image of Dublin. It bridges Temple Bar to O’Connell street. O’Connell Street is the main north south street in Dublin. It is a fashionable place to live and is named after the man who fought for the Catholic emancipation act. You will see a monument to Daniel O’Connell as you cross the bridge. Not far from O’Connell Street is Moore Street, home to the Moore Street Market. Fresh fruit, vegetables, cut flowers and shrill cries from the stall holders are a sight to behold in this busiest part of the city. If you are interested in Irish literature, a stop at the James Joyce Cultural Center and the Dublin’s Writers Museum will enlighten you as to the many literary geniuses that walked the streets of Dublin. A great way to end the day on this side of town is a visit to the Jameson Distillery for a tour of Irish Whiskey making and a tasting.